A combat simulator designed for research, training and evaluation of dog-fight situations within visual range. MSE has, as a subcontractor upon function specifications, designed, produced and installed a complete hardware solution - including computer systems, communications, virtual instrumentation, force feedback, head tracker and head mounted displays (HMD). This is a typical MSE design. We deliver, with full functional responsibility, a hardware platform fully integrated and ready for download of simulation software. All components are COTS products of latest technology. In the flight simulator all our in-house capabilities, mechanic and electronic engineering, prototyping, optics, motion control, software and documentation are built in. The MSE concept gives you, as customer, unique advantages in form of rapid prototyping, very short delivery times and functional guarantee at extremely competitive prices. We have experience in most types of simulation equipment and will integrate them for you. • Autonomous. 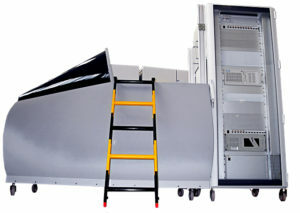 The simulator includes all necessary components and computing power necessary for its operation. • Mobile. The lightweight construction is equipped with wheels and is fully movable. • Accessible. The glass-fibre body may be removed in seconds giving full access to all internal systems. • Integrated computer rack. Containing computing power, electronics and safety circuits. Built to highest safety, emission and immunity standards. • CAN-bus I/O-interface. All data collection and feedback is made via industrial standard fieldbus. Easily expanded and redesigned. • Force-feedback. MSE designed electronic system for pedals and stick. • Build in virtual front panel display. • Integrated head tracker system. • Panels and controls. A combination of ”real”, and MSE-designed replica units. All interfaced via the CAN-bus. • Sound system. Powerful 6-channel system integrated in cockpit.